If my goal for the day’s sketch is complicated, it helps a lot to make a preliminary sketch or two. That way I can work through some of the challenges without worrying that I will wreck my work. My preliminary sketches are often in pastel and usually take 5 to 20 minutes. Today’s sketch of a path through a thicket of graceful cottonwood trees at the Telluride Town Park was definitely complex and so I developed this preliminary sketch to use as a guide. Since I did not finish the painting, I am posting the preliminary pastel sketch. 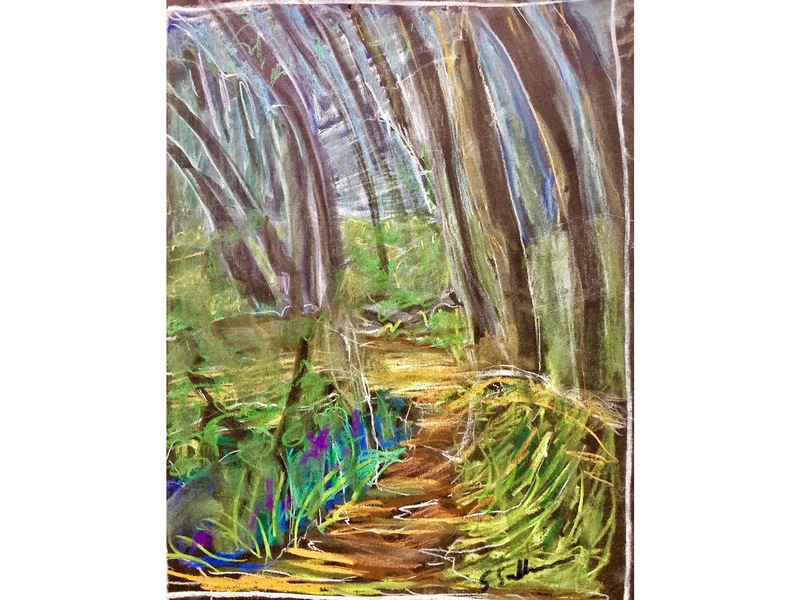 This entry was posted in Landscape and tagged Colorado, Deliberate Practice, Landscape, Line, Pastel, Telluride, Town Park. Bookmark the permalink. Lovely sketch – am eager to see your drawing of it! It is fun to see a sketch compared to a final product.